Small Arch Address Sign Plaque with Oak Tree - - personalized address sign includes a large oak tree emblem inside the arch and holds up to four (4) large 3" characters. Wall mount or lawn mount with an optional lawn stake. Made in USA. The thin border accents the arch shape and is the same color as the personalization and tree emblem. Available with or without one 23" lawn stake. 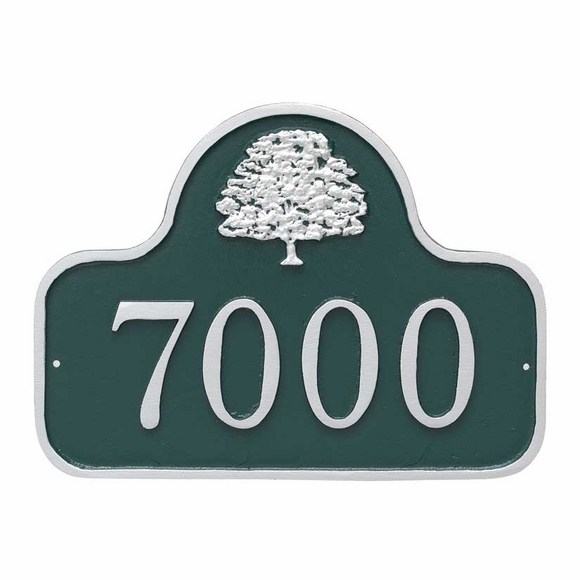 Tree-theme personalized address sign with large 3" numbers. Wall mount or lawn mount. Arch shape. Made in the USA.